To have an effective sales strategy a business needs to consider its products, its market and how the sales effort will be directed to ensure it captures profitable growth selling to customers. Sales strategy is a business decision on (1) who the sales teams are going to sell to (2) what are they going to sell them and (3) how are they going to sell to them? Sales strategies ensures market and customer coverage with plans that give the best possible opportunity to win business. In more detail, a sales strategy defines the customer segments it wants to target(verticals, industries, geographical), the business value propositions for each segment (product, pricing, distribution), how the sales force will be structured (inbound, field, deal value) and the selling processes. Today’s business is more about “Smarketing” than sales and marketing. Effective business strategy brings marketing and sales together to drive traffic, generate leads, build awareness and improve consideration levels so more customers buy. In a nutshell a good sales strategy will help a business identify and take advantage of the best opportunities available. 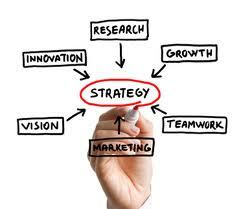 The sales strategy must be based on the business and marketing plans. Outline in as much detail as possible – how will the sales team deliver marketing objectives, plan to target market segments and how will they support marketing activities, such as content marketing or promotional events. Next identify the key aims of the strategy – sell more to the same? Is it about market penetration or market development? Also which target markets you are aiming for and the time, money and resources needed. Understand the market and find out more about your existing customers or target customer profile. What are their needs, what problems need solving, what products they consider and what they expect from a product or supplier? Research when, where, how and why the existing customer base buys. In a B2B sales environment identify who Influences buying decisions both inside the company and on social networks or industry forums. Monitor key trends in the market and social media, trends like market changes and the activities of competitors. Identify what will be the key drivers for the business that the market will buy. Pay attention to the cost of customer acquisition and selling costs. List existing customers in order of profitability then create a list of existing, potential and major customers. Always include the total cost of selling to each one by sales channel. Identify the metrics or sales KPI’s that will enable the business to understand what a profitable customer looks like. Now use these profiles to target similar companies. So the sales strategy plan should now be in line with the marketing strategy and the planning should have costs associated to the sales efforts. For existing businesses develop more business with existing customers. Plan out what you will do to get existing customers buy more and buy different products (‘up-’ and ‘cross-selling’). Plan how to keep retain customers and build relationships. A sales strategy should include a mix of customers, to help safeguard sales revenue. Do not rely too much on one customer, and be aware of potential customer finance problems. Sales plans should include a balance between time spent developing new business and that spent on existing customers. Forecast and manage seasonal sales or sales cycles. Now that customer target selection has been set, you need to decide which sales channels will be most effective in selling to which customers. Do you sell direct or through channels? Map out the costs of each channel against the benefits it would bring. Most businesses have a direct sales strategy. Direct sales methods include web, e-commerce, selling face-to-face, direct mail, social selling and telesales. Selling face-to-face is the most expensive sales method, and works well for enterprise high-value sales with a longer sales cycle. Together with your sales managers and team(s), prepare the sales forecast. Sales forecasting is a detailed breakdown of the sales to be achieved each month, by customer and by product .Base forecasts on previous sales levels or if a new business base on the business plan. Take into account information about customers’ buying habits, sales cycle and other factors such as pricing and marketing activities. Plot the likelihood of achieving sales, using a percentage figure, and set out timescales when you expect to close them. Agree how much traffic, enquiries and leads are needed to achieve the forecasted sales growth. Divide out how many leads should come from new and existing customers. Sales planning should identify customers by name where possible but always the number you expect to sell to. Define the number of sales you expect from sales KPI’s such as meetings, calls or other contacts (your sales ‘conversion’ rate). Determine the frequency and levels of sales activity needed to achieve targets. For example, allocate the amount of time to be spent on each account. Remember to include the whole range of activities needed to complete a sale. Decide how many sales people you need to achieve your sales targets, and allocate territories or accounts. Plan sales costs in proportion to the sales or profits you expect to make. Prepare the annual sales budget. This is a summary of the yearly sales forecast and acts as a benchmark to compare updated forecasts during the year. Prepare worst case, likely case and best case versions of the budget, and plan what you will do in each case. Revise your sales forecasts monthly, quarterly or annually, using past performance as the guide. Compare sales closed and the sales pipeline with the sales budget. If there is a significant difference between the two figures, find out why. Sales leadership is about adjusting to new challenges, planning new sales initiatives and knowing when to adjust sales expenditure. Don’t underestimate the sales cycles. The total amount of time taken to complete a sale or acquire a new customer can have a critical impact on a business’s cash flow. If you have a market development strategy, new product or service, it will take longer to make sales. Work with customers’ decision-making habits. Plan out sales drives and product launches in detail. Align sales to the other business activities. An example is not to forecast sales that the software development team cannot deliver. Plan the sales campaigns and social selling to support the marketing strategy (new product launches or new whitepaper). When the sales strategy has been defined, a business may need to adjust the marketing plan as the sales team could have identified a new customer group to target. There is now a range of sales tools available to a business of any size that will increase efficiency. A CRM or sales forecasting tool is essential to manage information on customers. Consider what resources could make your sales people more productive (example: premium LinkedIn account, Pipedrive, Trello, Zoho, and Salesforce). Also plan to provide appropriate admin support to allow sales people more time to focus on selling. Ensure sales people have access to documents like content marketing pieces, research papers, white papers, industry stats and market research. Use an on-line sales report tool (like Pipedrive) to record relevant information for each customer contact. Inform and support the sales team. Have regular sessions to make sure sales people understand the business mission, what sets the product or service apart and train them to communicate this to customers. Understand just what value your product or service will bring to the customer’s business; this is the value proposition. Give sales people key information about pricing, profit margins, negotiable areas and product roadmaps. Demand that sales people record their sales activities and produce weekly reports. The sales pipeline by sales person should be scored for each customer deal, reflecting the potential value of sales and the percentage likelihood of conversion. Train the sales people regularly to improve their product and market knowledge as well as selling skills. Monitor and drive progress in supportive, weekly one-to-one meetings to review progress. Cost of sale analysis. Review and quantify the time and money spent on different customers. Focus on profitability, margin or deal size before volume of sales. Dig into the win/loss ratio, cost per lead, lead to conversion and cost per customer sale. Analyse which customer segments, sales people and channels are most productive, and the reason why. Monitor the returns on sales costs. Separate out sales force and sales support costs. Analyse conversion rates monthly, using the sales team’s pipeline, forecast and weekly activity reports. Work out how many sales have been made, the cost of customer acquisition and calculate the average value. Measure the data between leads, visits, proposals and deals closed. This goes for both new and existing customers. Examine each stage in the selling process to find out where customers are falling out of the sales funnel. Identify problems in the sales process or funnel and find out what has caused them. Do you have low sales into new accounts because of long lead times or the value proposition needs tuning. Identify dead deals or dormant accounts and follow them up. Always remember that selling to an existing customer is far easier and cheaper than winning new ones. At the end of the sales and business strategy planning process, a business will have when combined with deep customer insights and needs plus the buying processes will have identified growth channels. Tailor the sales strategy to the market opportunity will ensure sales leadership make winning decisions about where to allocate sales and marketing resources, how to structure the sales force, and how to choose the best sales process that will drive results on a constant basis for the business.